Indian poet-diplomat Abhay K. has become the first Indian poet invited to record his poems at the Library of Congress in Washington D.C. in 'The Poet and the Poem' series conducted by poet Grace Cavalieri. The prestigious reading series recorded at the Library of Congress since 1997 has featured major American poets such as Robert Hass, Richard Blanco, Eavan Boland, Billy Collins, Rita Dove, Louise Glück, Donal Hall, Terance Hayes, Juan Felipe Herrera, Ted Kooser, Philip Levine, W.S. Merwin, Naomi Shihab Nye, Robert Pinsky, Charles Simic, Natasha Trethewey, Monica Youn, Tracey K. Smith among others. During his visit to Washington DC, Abhay has also been invited to read at the city's iconic Busboys and Poets Bookstore along with other poet-diplomats Indran Amirthanayagnam and Simon Schuchat and poetry co-editor of Beltway Poetry Review Venus Thrash at a poetry event titled 'Poetry and Diplomacy' which is co-sponsored by Beltway Poetry Review. Abhay K. is the author of a memoir and seven collections of poems including The Seduction of Delhi (2014), The Eight-eyed Lord of Kathmandu (2017) and The Prophecy of Brasilia (2018). His poem-song 'Earth Anthem' is translated into over thirty languages and has been performed by Symphony Orchestra of National Theatre of Brasilia and has been composed by renowned violinist Dr. L. Subramaniam and sung by Kavita Krishnamurti. His poems have appeared in over sixty international literary journals including Poetry Salzburg Review and Asia Literary Review. He received the SAARC Literary Award 2013 and was nominated for Pushcart Prize in 2013. He is also the editor of poetry anthologies CAPITALS and 100 Great Indian Poems. Born in 1980 in a small village in Nalanda district of Bihar, India, Abhay started writing poetry in 2005 after arriving in Russia's capital Moscow and publishing them initially on his blog. His first collection of poems Enigmatic Love was published in 2009. 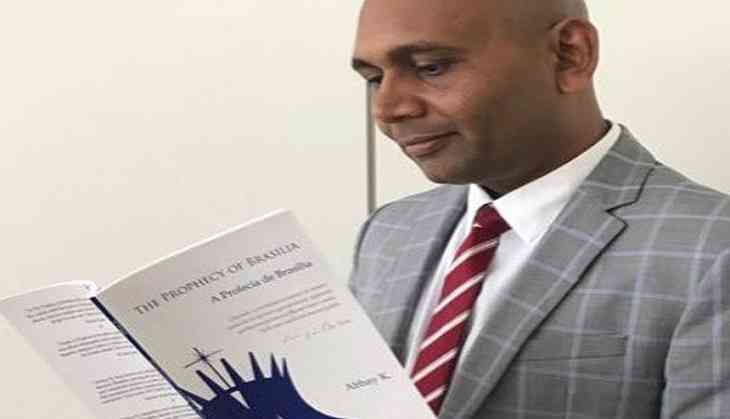 Since then he has published seven collections of poems in all, the latest among them is a collection of poems on Brazil's planned capital city titled The Prophecy of Brasilia.